Have a question on Edge? Edge is available in 10 different colors - Oxford White, Magnetic Metallic, Blue Jeans Metallic, White Paltinum, Ruby Red, Ingot Silver Meatallic, Burgandy Red, Canyon Ridge, White Gold and Shadow Black. Watch latest video reviews of Ford Edge to know about its interiors, exteriors, performance, mileage and more. 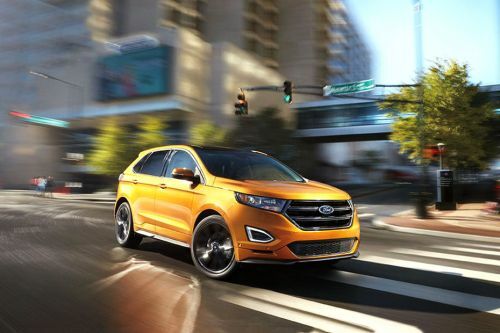 Since the inception of Ford’s latest mid-size crossover, Ford Edge is in high demand due to its bold styling, classy interior and profusion of numerous modern-tech instruments, appealing those who are looking for a sporty crossover with some exaggeration. With powerful engine and remarkable performance, Edge is now on its way to lead the Middle East auto markets. This crossover adapts the platform of sedan, rather than a truck chassis, which make you quiet comfortable and relaxed during long journeys. New Ford Edge shows its exhilarating agility and breathtaking design, while accentuating its sporty and aggressive appeal. The basic shape of this crossover, appears sleeker and more athletic with embedded compelling inserts. Talking about its front profile, large trapezoidal radiator grille with chrome finish makes this vehicle to stand out from the crowd. The Bi-functional projector-styled halogen headlamps not only underlines its facade, but also increases the visibility. At rear, the Edge features a well-sloped taper, exhausting is complete appearance. This crossover is available with a range of bold alloy wheels including 18-inch to 22-inch. The dimensions of this vehicle proposes as 4679mm x 1930mm x 1702mm (L x W x H), with wheelbase stands at 2824 mm. Ford Edge comes in four different trim levels for its UAE customers, named as Edge SE, Edge SEL, Edge Limited and Edge Sport. All-new variants are powered with two efficient petrol engine options such as 3.5-litre Ti-VCT V6 engine and 3.7-litre Ti-VCT V6 engine. 3.5-litre Ti-VCT V6 employed in SE, SEL and Limited trims generates power output of 285 hp, with peak torque generated as 343 Nm. However, in case of 3.7-litre Ti-VCT V6 engine appointed in Sport variant, the maximum power output measures as 305 hp along with high torque generated as 380 Nm, which appoints tremendous off-roading capabilities to the vehicle. To improve the vehicle’s handling, these powerful engines are paired with 6-speed SelectShift automatic transmission. Trims with 3.5-litre engine takes fuel consumption of 11.1 L/100km, whereas the 3.7-litre gives the fuel consumption as 11.8 L/100km. The manufacturer has introduced its standard AdvanceTrac® with RSC® (Roll Stability Control™) that puts you in control no matter what kind of situations you encounter. This advance system boasts the vehicle’s control, while keeping all the wheels firmly planted. Plus, the personal safety system unveiled by the auto maker providing maximum safety to the occupants. Further, this vehicle is appointed with airbags system that reduces the injury at the event of collision. Active braking system of Ford Edge delivers exceptional performance at the time of emergency as it is employed with anti-lock brakes at all-wheels individually. Embedded competent suspensions system including independent type suspension for front and rear as well as sport tuned suspension helps driver to enjoy the drive. If you are seeking for a spacious 5-passenger crossover, equipped with number of advance equipment along with high quality safety elements, then New Ford Edge is the right thing for you. However, the Nissan Pathfinder and Toyota Highlander offer much more prominent facets. What are the colors options available in Ford Edge?